Salvia coccinea has bright red flowers all summer long, making it a perfect bedding annual. It's also nice in containers. 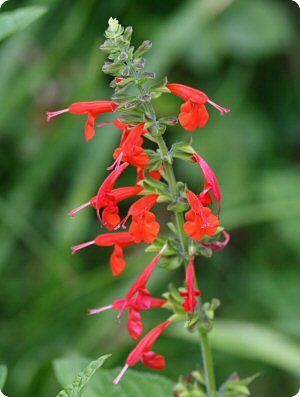 Salvia coccinea is one of the best flowers for hummingbirds. It is native to the southeastern United States and Mexico. 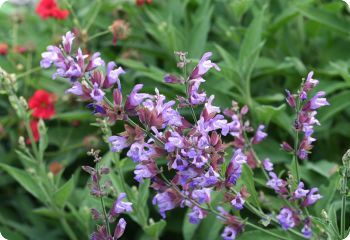 Also known as Hummingbird Sage, Texas Sage and Tropical Sage. Hardy in zones 8-11. Grow as an annual elsewhere. Easy to grow from seed. Salvia comes in a wide range of colors, sizes and forms. Some species are hardy, and others are grown as annuals in cold zones. Start salvia seeds indoors 6-8 weeks before the last frost date. Barely cover the seeds with soil. Full sun. Well-drained soil. Salvia farinacea is a popular bedding annual with tall spikes of deep blue flowers that bloom from late summer through fall. It attracts hummingbirds and butterflies. Try it with other late-blooming annuals like cosmos and zinnia. It makes a good cut flower. Hardy in zones 8-10. Grow as an annual elsewhere. Also called Mealy Sage. 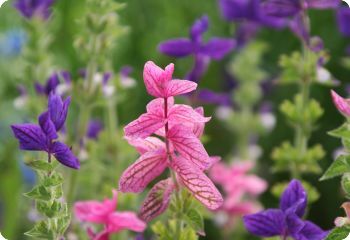 Salvia horminum 'Tricolor Mix' has violet-blue, rose-pink and white flowers. It blooms for a long time from late summer to fall. The leaves and flowers are edible, making it a nice addition to the herb garden. Salvia horminum is an heirloom flower that works well in the cottage garden. It self-sows where it's happy. It makes a nice cut flower and dried flower. Hardy annual. Also known as Salvia viridis, Annual Clary and Horminum Sage. Salvia azurea is a native prairie wildflower. It is the most striking blue flower in the garden in early fall. It blooms the first year from seed, so it can be grown as an annual. The azure-blue flowers attract hummingbirds and butterflies. Salvia azurea tends to flop when it gets tall. To keep it compact, pinch it back to 24" in late June. Or prop it up with a fence, stakes, or other tall plants. Salvia azurea is a drought-tolerant perennial. Also known as Salvia pitcheri and Pitcher Sage. Hardy in zones 5-9. Requires 3 weeks cold-moist stratification. Salvia officinalis is a perennial herb that is one of the main ingredients in poultry seasoning. Besides its culinary uses, the dried leaves can be placed in linen drawers to repel moths. Salvia officinalis is beautiful in the flower garden. 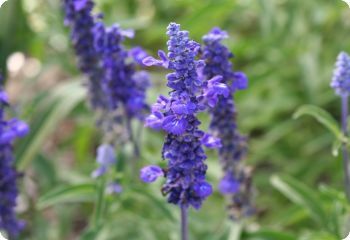 The blue-green leaves have a pebbly texture, and the tall wands of lavender flowers appear in early summer, attracting hummingbirds. It's shown here with Geum 'Mrs. Bradshaw'. Also known as Broadleaf Sage, Common Sage, Garden Sage, and Kitchen Sage. Deer resistant. Hardy in zones 4-9. Salvia 'Violet Queen' blooms in early summer with numerous spikes of dark violet flowers on bushy plants. It attracts hummingbirds and butterflies. Salvia 'Violet Queen' goes with almost everything in the garden. It makes a nice companion plant for roses. It sometimes self sows, but not in excess. 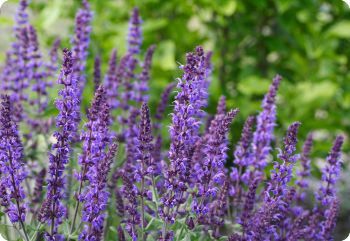 Salvia superba is drought tolerant and easy to grow. Other names include Salvia nemerosa, Salvia sylvestris and Meadow Sage. Hardy perennial in zones 4-9. 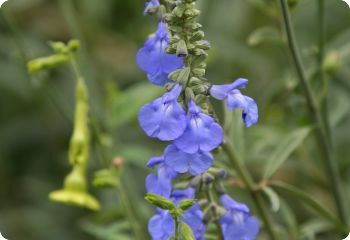 Salvia 'Blue Spires' blooms in early to midsummer with deep blue flowers on tall stems. It's one of the showiest salvias in the garden. It goes with everything, and the vivid flowers attract hummingbirds. What more can you ask for? Salvia transylvanica 'Blue Spires' is fairly drought tolerant. Cut down the spent stems to encourage repeat blooming. Shown here with California poppies. Also known as Romanian Sage. Hardy perennial in zones 4-9.